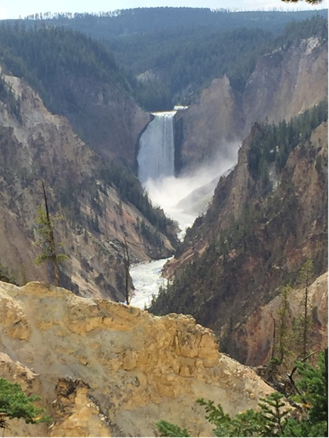 My family and I recently returned from vacation in Yellowstone National Park. An amazing place if you’ve never been. We hiked many beautiful trails – one (pictured below) took us across the plains and around a bend where we entered a deep valley carved by snow-capped mountains. Steam and water billowed from hot springs in the ground in great, misty showers, and I found myself thinking someone other than Mother Nature must have created this beauty. But there were dangers lurking amid the tranquility. 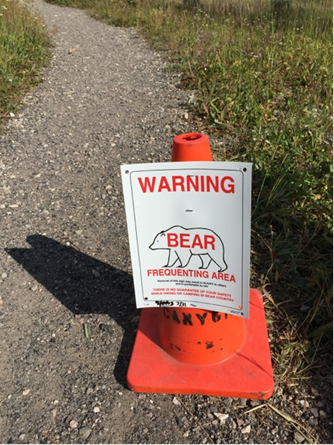 Not far from that beautiful picture, we encountered the following sign … about two miles from the nearest car. My husband Jerry insisted we were OK without our bear bells or spray because we had our noisy daughter Tori. He may have been right. We escaped without harm, although Tori did mention one area of a trail smelled like the zoo. I admit I walked a little faster there. Although there were risks, it was well worth walking further into the park to take in beautiful sights that few people see. Investors are wondering: Is weakness here to stay, and how low can equity prices go? The next few weeks are likely to be highly volatile as opinions fly on whether the Fed will or will not raise the Fed funds rate at its September 17 meeting. Bears are front and center in the debate. The decision to rise is feared harmful to economic growth and the decision to keep rates steady a sign of significant global weakness. Following the release of minutes from its July meeting, Fed funds futures indicated the probability of a September rate hike dropped to 38%, down from 97.3% last November. Fed funds futures are not perfect, and many professionals still believe a September hike is likely. We’ll be watching releases on inflation and the U.S. labor market as major indicators of the Fed’s next moves. But no matter what happens, there will always be bears in the woods. Making sure your portfolio is positioned appropriately, however, will help you make it off the trail unscathed and reward you with amazing sights along the way. The S&P 500 Index is an unmanaged composite of 500-large capitalization companies. This index is widely used by professional investors as a performance benchmark for large-cap stocks. The Dow Jones Industrial Average (DJIA) is a price weighted index of 30 of the largest, most widely held stocks traded on the New York Stock Exchange. An index is an unmanaged group of stocks considered to be representative of different segments of the stock market in general. You cannot invest directly in an index.